The Water Rocket Competition was hosted by LAPAN (the Indonesian Institute of Aeronautics and Space Agency) in cooperation with JAXA (Japan Aerospace and Exploration Agency) attended by 150 students, teachers and observers from 13 Asia-Pacific Countries including Indonesia, Japan, India, China, Thailand, Malaysia, Philippines, Sri Lanka, Vietnam, Cambodia, Pakistan, Bangladesh and Nepal. 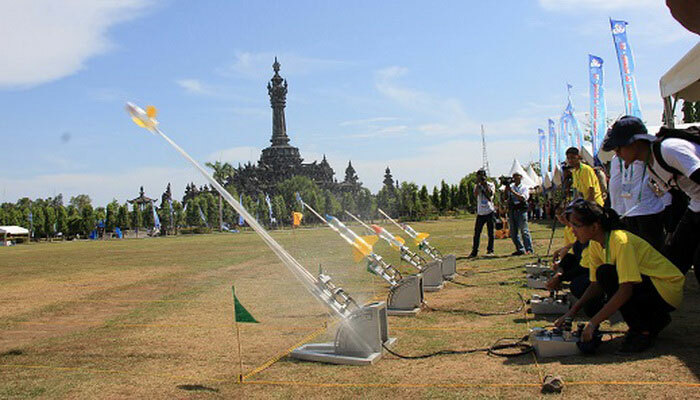 The Water Rocket Launch took place at Niti Mandala, Renon Square and was officially opened by the Head of LAPAN, Prof. Dr. Thomas Djamaluddin, accompanied by the Director of JAXA Mr. Nozomu Sakuraba. The program of the event included a teachers' workshop, special lecture on aeronautics, visit to Bajra Sandhi Monument, field trip to Garuda Wishnu Kencana Cultural Park and friendship dinner. The winners of the competition were students from Thailand and Sri Lanka.